The Criss Cross Bracelet is a simple weave that has many possible variations. You can make it to suit your taste. The picture shows three bracelets. Starting from the top there is a two tone small bracelet, a two tone small bracelet with crystal flowers and a large sterling silver bracelet. The large bracelet is a beginner weave with the small bracelets being more of a challenge because of their very small connecting rings. In the small bracelets, flat stones or other flat beads may be utilized instead of the crystal Swarovski flowers. The kit will have enough rings to make the bracelet without crystals or other types of beads. You may add them if you like. This is a beginner weave. 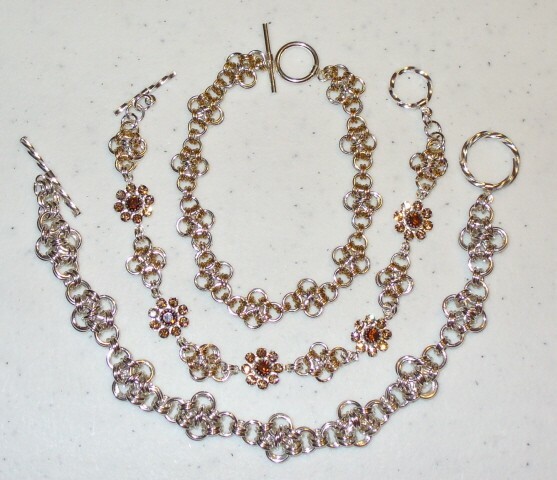 The clasp and crystals are not included in the kit.